The gods must be… well… quite helpful, actually, in this quick and colorful civilization game. Getting most civilization games to the table can be tricky. You usually need to allot an entire afternoon or evening to them, then recruit others willing to do the same to join in. There are more than a few of us who love these games when we can play them… but longingly stare at them on our shelves far more than we get them out. Deus is a great little (for a civ game) remedy to fill in all those nights where the fates conspire to rob you of longer fare. The playing surface of Deus is made up of a fixed number of continent tiles. 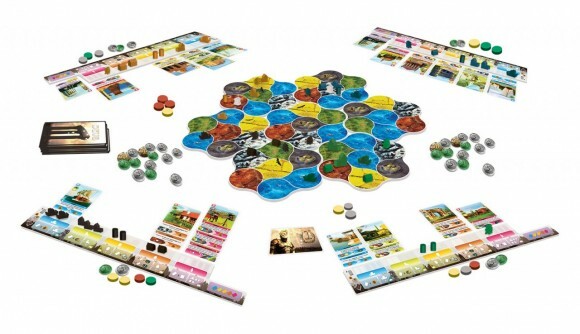 A 4-player game will use all 7 of the included tiles, a 3-player game 6, and a 2-player game 4. Each of the tiles is two-sided, so you’ll randomly pick the appropriate number of tiles, randomly pick a side and place them to form the game board. There is only one rule for tile placement: don’t talk about tile placement. Wait, that’s not right… Oh yes, it’s that barbarian villages (dark grey spaces) may never touch. There are 6 types of terrain spaces on each tile: fields, forests, mountains, swamps, water and barbarian villages. If the barbarian villages on any 2 randomly-placed tiles are touching, one of the tiles will have to be rotated. Next each player sets up their individual player boards. These are long, thin boards designed to hold your building meeples and provide organization for the placement of your cards during the game. Onto each player’s board goes 2 of each of the 5 building types in a player’s color, on the appropriate spot (the player boards have light outlines in the shape of each of the building pieces to avoid confusion during first play). Remaining building pieces – each player has 5 of each building, or 25 total buildings – sit to the side until they are earned during gameplay. Players also claim one of each resource (wooden discs in 4 flavors – stone, clay, wheat and wood), 5 gold coins and 5 victory point tokens (yes, this is one of those generous games that lets you start with victory points!) to start with. Finally, set-up winds down by shuffling a building card deck and dealing 5 cards to each player to form their starting hands. While not an “easy” set-up, Deus isn’t as onerous as other table-sprawling civilization games. It’s handled in under 10 minutes. On your turn you will take one of two actions: construct a building or make an offering to the gods. However, this small list of options drastically undersells the planning and resource management required. In order to play a card you must posses a building of the appropriate type on your player board, as well as any necessary resources to build it. These may be any of the four resources mentioned above as well as gold coins. Once you pay the resource cost you will move a building of the appropriate type from your player board to the game board. But you can’t just place your building all nimbly-bimbly; you must place it in a region that already contains one of your buildings (although not the same TYPE of building – only one of each on a space) or in an empty region directly adjacent to one you occupy. Your first building can be placed in any space along the edge of the game board. There are two additional restrictions on where buildings can be played. No building can be played on a barbarian village, and only maritime fleets may be placed on water (blue spaces). However, a military unit may be placed on a water space that already contains one of your maritime fleets. Text on the cards played, which remain above your player board for the remainder of the game, give you some kind of benefit – but only when you first play the card or play another card on top of it. Some cards will earn you resources, gold coins or victory points; others will allow you to move additional buildings onto your player board or move military units around the board. The number of cards you discard will determine how many resources, gold or VP you’ll collect from the offering, or how many additional cards you’ll be allowed to hold in your hand over the normal 5. The top face-up card you discard will determine which god you make the offering to, and thus which benefit you’ll receive. For instance, if you’re discarding 4 cards you will place them face-up in the discard pile, and only the one on top will be visible (your opponents won’t see the other 3 cards); it’s this god the corresponding offering is made to. You will need to have a building plan to focus on how you will accumulate your victory points. While some victory points are available from playing buildings and making offerings, the big victory points come from temples and barbarian villages. There are 7 temples included in Deus, but you only use a complete allotment in a 4-player game. The temple count used in a game will equal the continent tiles used – in a 3-player game 6, and in a 2-player game 4. Temples are in a neutral white color, and all players are competing to build from the same pool. Once you build a temple it will guide your strategy; they provide end-of-game victory points based on certain conditions (for instance, 3 victory points for every space you have 3 buildings on at the end of the game, or 4 victory points for every mountain you occupy), and you’ll want to play to those conditions. Your first temple can be built at any time, but future temples can only be built when you complete a set of 5 other buildings. If your first temple is already in play and you want to build a second one, you will have to have a maritime fleet, production building, science building, civil building and military unit already on the board. This is why the player boards are indented on the right side – to provide an easy visual for allowed temples. Your last source of larger amounts of victory points come from barbarian villages. At the start of the game a number of victory points equal to the number of bordering spaces is placed on each barbarian village (6 for an “embedded” village, 3 for a village on the periphery). Once a village is completely surrounded by buildings (these can be buildings from multiple players), the player with the most military units bordering the village wins the victory points. If any number of players are tied, the victory points are split evenly and any remainder is returned to the box. Once a condition has triggered game-end the current round is finished and one more round is played. This gives everybody a chance to make a final move to maximize victory points, and hopefully prevents players from ending with unfulfilled plans. Once finished, each player claims any victory point tokens awarded by their temples and the final tally is made. The 7 continent tiles in Deus are of fine quality – not that thick but highly resistant to fraying at the edges. The bubbled shape of the continent tiles makes it so that they shift less during play than the flat-edged tiles used in many games. The player boards are of equal quality and useful for keeping things organized, but the symbols for the “make an offering to the gods” action could have been more intuitive. For the first play it was necessary for us to reference the rulebook to recall what each god would do. The wooden parts are plentiful and quite nice. There are 107 buildings (25 in each of 4 player colors and 7 neutral temples); while most of them are in standard geometric shapes found in most games, a few – temples, maritime fleets and military units – are unique cuts that look nice and seem sturdy enough to avoid extremities breaking off. Also in the wood department are 80 resource discs (20 of each resource). While discs aren’t very thematic, these can be problematic for a different reason: the discs representing wood are brown (which makes sense on its own), but are produced in forests – the green spots on the board. Clay (red disc) is produced in swamps, which are colored a very muddy brown-red. It’s very easy to grab a wood instead of a clay when your swamps produce, particularly because the other regions produce goods in the same color as their space. The cards in Deus have a very fine linen finish that doesn’t detract from the artwork. There are 96 total cards (16 for each of the 6 building types) containing 27 different illustrations. The remaining pieces – 84 gold coins and 59 victory point tokens – are of the same cardboard stock as the continent tiles and player boards. It’s worth noting that “gold” in Deus is either green, silver or pale gold depending on denomination, while victory points are always bright gold. This can be a little confusing. Deus is on the lower end of the learning curve for civilization games, but has a moderate learning curve overall due to its genre’s heaviness. There are fewer parts here than other civilization games, which helps streamline things. It would certainly be helpful if the few areas of possible confusion – the aforementioned clay/wood/swamp issue and the sometimes difficult-to-parse player board symbols – were cleaned up, but overall Deus won’t provide a learning challenge to anybody used to medium-weight games. Deus won’t work at all with children, but families with teenagers can find a lot to like here, with nothing thematically distracting. She’s a thinker, not a drinker. Like all civ games, Deus requires the formation of a plan and typically rewards those who stick best to it. There is some randomness/luck based on card draws, but you can usually correct a bad draw in one turn by utilizing the god that allows for a hand dump and increased hand size. This is the best bet for a casual gamer looking for a civilization game. It may be a little heavier than a casual gamer is used to, but it will beat the alternatives. It’s not too tough to teach, and there are a bunch of pretty bits and pieces to draw players in. Civilization games are usually a draw for power gamers. But this is lighter than the others, so it won’t be a power gamer’s favorite in the genre. Deus is a pleasantly colorful game with a bunch of nice little affectations, but there were a few things I found odd. There is no reason to start the game with 5 victory points – this is something usually done when it’s possible to lose victory points during the game, but that can’t happen in Deus so it only serves to inflate final scores. This is just nit-picking; if it bothers you, don’t dole out the starting VP tokens. A little more distracting was the 2-victory point limit on the god that delivers those (Vesta). Every other offering results in a number of benefits equal to the cards discarded. I’m sure this came from play-testing exposing that allowing a 1-to-1 ratio was extremely over-powered (scores are usually in the 20s to low 40s from 15 or so rounds of play – if you could just dump your entire hand for 5 victory points every turn you’d end up with 75 points). But it still comes across a little clunky compared to the unrestricted nature of the other gods. But these are minor gripes. Overall this is a well-designed and fun game. It can be tough being a fan of civilization builders surrounded by people who prefer games of the “1 hour or less” variety. If this is you, Deus is a must-buy. For everybody else this is a great game to have in the library for those nights where time is short but you want to build something. It won’t feel as rewarding as 3 hours of twists and turns that ultimately lead to your original vision, but it will feel like a good compromise. Set out to conquer barbarian villages or increase your scientific knowledge. Don’t forget to maintain good standing with the Gods! Pay tribute to them by making offerings and by building fabulous temples. Constructing a building consists of playing a Building card, and placing the associated wooden piece in a region of the gameboard. You must place the building card in the column of the same color, and then you can benefit from the power of all the cards placed in this column, starting at the bottom. The powers of buildings allow you to gain victory points, resources, or money, make scientific advancements, or attack your neighbors. It is also possible to construct a temple, which provides victory points at the end of the game. Making an offering to a god consists of discarding cards in order to receive aid from the god associated with one of these cards. Then you draw cards until you have five cards in your hand again. Deus is quite a weird game as it at first can be very overwhelming and you’ll barely have any idea what to do. After a couple of plays you’ll realize that it is in fact quite easy. 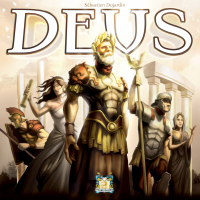 Deus is very much a eurofied-civ-lite game and plays in about an hour. Winner determined by who scores the most points with the majority coming through building temples and attacking barbarian villages. Each player takes all the pieces of one color, one player board, one good of each type, 5 gold, 5 victory points and 5 cards. 2 buildings of each type is added to the player board while the remaining are placed to the side. On the map a number of victory points are added to the barbarian villages equal to the number of neighboring regions. Choose a building in your hand, pay the cost and place it above the appropriate column on your player board. Place a wooden figure on the map, if it is your first build, place it on a region on the edge. Otherwise, place it adjacent to or in a region where you’ve already built with the restriction of only one of each building type pr. region and only maritime buildings (boats) placed in the water regions. Then you may choose to benefit from all previous buildings placed in that column. Temples have no effects on gameplay but each temple will score you up to 12 points at game end. Each temple costs one of each resource and the first one has no prerequisites. Each following however needs to have a full set of standard buildings before it may be built. If every region around a barbarian village has been built upon with at least one military building present it is attacked. The player with the most armies around the village takes all victory points left on the village region. If two or more players have the same amount of armies, ties are broken by number of buildings and if still a tie the points are shared, rounding down fractions. To make an offering you discard 1 or more cards from your hand showing only the top most. This card determines what favor you’ll get and may be money, resources, points, cards or adding buildings to your player board. After making an offering you draw up to 5 cards and this is the only time you get to draw cards. You do not draw new cards after building with the exception if you built your last card in hand. The game end is triggered if all temples have been built or all barbarian villages have been attacked. Each player’s points total is the VP earned during the game and temples. In addition there are 2 points for majority for each resource including gold. Deus will at first appear overly complicated with lots of different cards, buildings possible actions but a couple of plays in you’ll see it is difficult at all. To me it is a very similar feeling to my first impression of imperial Settlers. You’ll want a good production line to get resources, but you also want to build in each category to allow Temple building. The cards will very much determine your path and try and make the most of your temples. Two temples scoring 12 points each will likely be more than half of your final total. For those of you who don’t want to read my entire review I’ll give you a summary: I LOVE this game! Ignore all the people calling this a “civilization” or “civ-lite” game…it’s not. It’s a fun Euro game trying to be deceptive. If you go in expecting a world building epic you’ll be sorely disappointed. In a nutshell, you’re trying to play cards from your hands for points. The cards correspond to one of the Roman gods and you can play them in one of two ways. Either place the card down in the corresponding space on your tableau (paying the cost in resources and/or money to do so) then place a building out on the game board and then get the bonus listed on the card OR you “sacrifice” the card (and any other cards you don’t want) to the corresponding god and get the bonus associated with the god. You’ll either get money, resources, extra cards, victory points, or extra buildings to place. The twist is that when you place another card down you not only get the bonus for the card you just laid, but the bonuses for every other card in that column, starting at the bottom with the first card and ending with the card you just played. It’s a bit overwhelming at first, but after a play through you’ll start to get the ebb and flow of the game. Do I have a good set of cards to work with? Yes? Super! Erm, except I don’t have the resources to play them! Do I have any cards to get the resources I need? Uh…OK, time to sacrifice to the gods! The great thing about the mechanic is you aren’t constrained by your cards, because if you hate them you can just toss them for a benefit and draw some new cards. I’ve played games where I had an incredibly good opening hand full of cards that had good synergy and games where I was sacrificing left right and centre in order to get something I needed. Like most Euro’s, there’s not a huge amount of player interaction. You can definitely block people on the board from building in a certain area and a few cards let you steal victory points but it’s mostly a solitary experience. http://www.Boiteajeux.net has a nice free version so you can “try before you buy”! Add a Review for "Deus"